Come and camp in the Lutkemeer while it is still possible… Since this Amsterdam polder is threatened to disappear in exchange for yet another unnecessary company terrain. For this reason, a widely supported action weekend, led by platform Behoud Lutkemeerfrom, is organised from Sept. 14-16. See www.behoudlutkemeer.nl for the full program. A wide view, fertile clay soil, the only organic farm on arable land within city limits, a monumental orchard and historical value. Just right here in Amsterdam. The Lutkemeerpolder is quite a special area: a gorgeous green area, sandwiched between company terrains and Schiphol. It is an important ecological place. Despite the pressure of big money, the Lutkemeerpolder has been kept as it is for the span of decennia. However, the pressure is increasing rapidly. 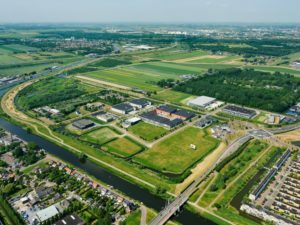 Schiphol Area Development Company (SADC) would like to start construction this very month, despite the fact that maintaining the Lutkemeerpolder is still on the agenda of the municipal council. If this happens, then SADC will cause irreparable damage. The municipality can still make the difference. The municipalities of Amsterdam and Haarlemmermeer, the province of Noord-Holland and Schiphol are the shareholders of SADC in equal parts. This means that maintaining the polder is a matter of political willpower. Is the objective to get their hands on the big money, or will the government protect a unique location? Will the government truly act as a government, or more like a project developer? Organic care farm De Boterbloem is pivotal in this conflict. They are in a frantic battle for survival, and platform Behoud Lutkemeer supports this fight. Many more reasons to maintain the Lutkemeer will be highlighted during the action weekend. After all, this fight is about much more than just a farm: it is also about keeping of green, breathing space for Amsterdam and about history. All these themes will be covered in lectures, exhibitions, hikes and actions. You can find the complete program on the website and facebook event. 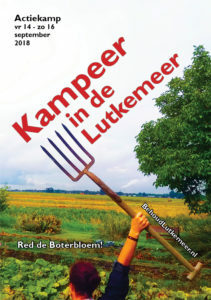 Food forests, frayed edges, alternative agriculture and urban development… All these topics will be addressed on the Saturday program during the action camp ‘Kampeer in de Lutkemeer’ (Camp in the Lutkemeer) of 14-16 september 2018. The following speakers are planned between 11:00 to 19:00. around the theme of ‘Agriculture & Climate’: Flip from Aseed will talk about the relationship between agriculture and climate change; Arnold van der Valk will hold a lecture about urban development in relation to (urban) agricultural areas; Toekomstboeren will talk with the people in the hall about access to land; Wouter van Eck will talk about the background of successful food forests and finally, Coöperatie Biopolder will present a future plan for the Lutkemeerpolder. In addition to this program, there will be children activities, theater and music, a series of workshops with the theme ‘Grond & Geld’ (Soil & Money). On Sunday there will be a playful action, sowing for the future and a concert of De Kift. Read here more info about the long-lasting fight for the Lutkemeerpolder.